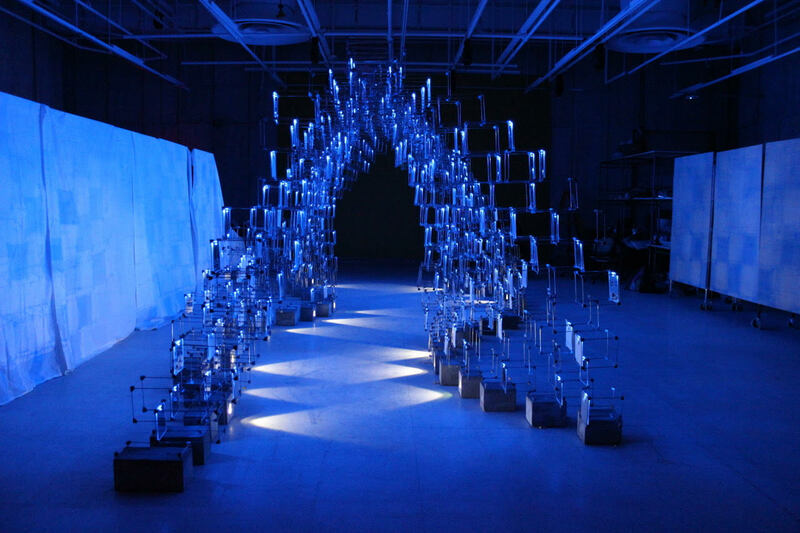 AMES, Iowa — An interactive pavilion designed by Iowa State University students will provide new perspectives on self-image at the Flyover Fashion Fest May 5-6 in Iowa City. Titled “IMRU” (I am are you), the pavilion will be located in Blackhawk Mini Park, 201 E. Washington St., on the Pedestrian Mall in downtown Iowa City. 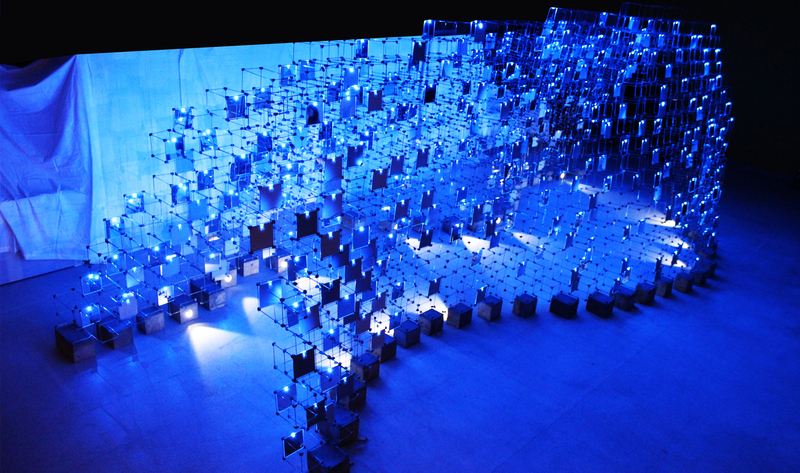 The 12-foot-by-30-foot serpentine structure, which features 450 small mirrors, is intended to create a “runway-like space” in which visitors see themselves reflected as “pixelated” fragments. “When you look at the mirrors you can never see your entire self; you see pieces of yourself in the context of your surroundings,” said interior design senior Cassie Cook, Maquoketa. “Think of breaking yourself down into these components, examining and learning to become comfortable with every part of you. The pavilion poses the question of ‘what do you see when you look in the mirror?’ and you fill in the blank, such as ‘I am living my truth; are you?’” she said. Cook and her classmates developed the pavilion this spring in the Fabricating Potentials option studio taught by Assistant Professor Shelby Doyle, Daniel J. Huberty Faculty Fellow in Architecture. She was approached by Simeon Talley, co-founder of the Iowa Fashion Project and Flyover Fashion Fest, after he saw the “Flux Pavilion” last year’s studio created for the 80/35 Music Festival in Des Moines. Students began the project by researching contemporary pavilions, fashion trends and “the ways in which fashion has been exploring fabrication capabilities,” Doyle said. She asked them to consider lightweight materials that could be easily transported, assembled and later recycled. And to “blur authorship” of the pavilion, she had students develop their concepts in many small and larger groups to produce dozens of iterations before settling on the final design. The class rose to the challenge, discovering what each of the three majors — architecture, landscape architecture and interior design — could contribute and how to collaborate effectively. “We had really interesting conversations about what a festival or a pavilion meant, before talking about materials and structure. Everyone had different perspectives,” said Erin Hunt, a senior in architecture from Dubuque. Knowing that activists promoting a positive body image and self-acceptance would attend the festival, the students wanted to convey that “as graduating seniors who are about to enter the real world, we have to accept ourselves” and made this their core concept, Cook said. The final structure consists of just over a thousand 6”x6” boxes made of eighth-inch galvanized steel wire fit together with more than 4,000 3D-printed plastic joints. The 450 Plexiglas mirrors are placed randomly in slots in the wire frames; the curving walls are supported by 56 concrete blocks to anchor the pavilion on site. The structure will be illuminated at night with LED lights attached to the mirrors and support blocks. After assembling and testing the pavilion on the Iowa State campus in April, the students have dismantled the structure for transport to Iowa City and will reassemble it on the Ped Mall Friday morning, May 5. After the festival in Iowa City, nearly all of the materials in the pavilion will be recycled. The LED lighting will be returned to the ISU Computation and Construction Lab (CCL) for use in future projects. The galvanized wire will be returned to the manufacturer for resale and the plastic joints will be ground down and respooled for use in new 3D printing projects. Doyle, who was hired under the ISU President’s High Impact Hires Initiative to combine digital fabrication and design/build at Iowa State and co-founded the CCL with colleagues in the architecture department, hopes the success of the Flux Pavilion and IMRU provides a springboard to future projects with new partners and communities. “As an instructor it’s exciting to see what design students can do when they have access to digital fabrication equipment and are pushing these tools to see what can be built with them,” she said. The students created three Snapchat geofilters that can be used to share experiences at the Iowa City festival. The project can be followed on Instagram using @isudesignbuild and the hashtag #IM_RU. 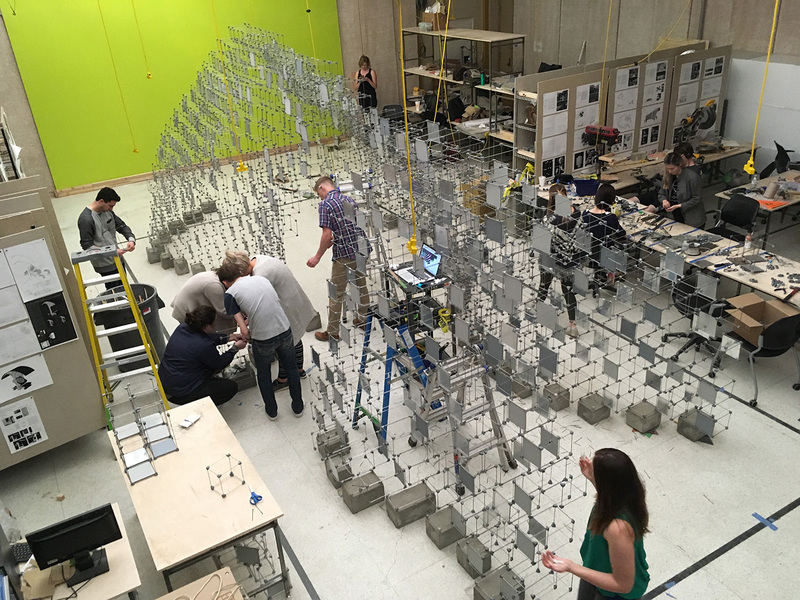 The spring 2017 Fabricating Potentials studio was supported by the Stan G. Thurston Professorship in Design Build, the Department of Architecture and the Flyover Fashion Fest.